Where do you think it was taken? What do you think is the backstory? For me the picture seems like something you might find in a brochure about impoverished countries in need of aid, or perhaps it would go along with a story about rural farmers struggling to make with a rapidly changing climate. 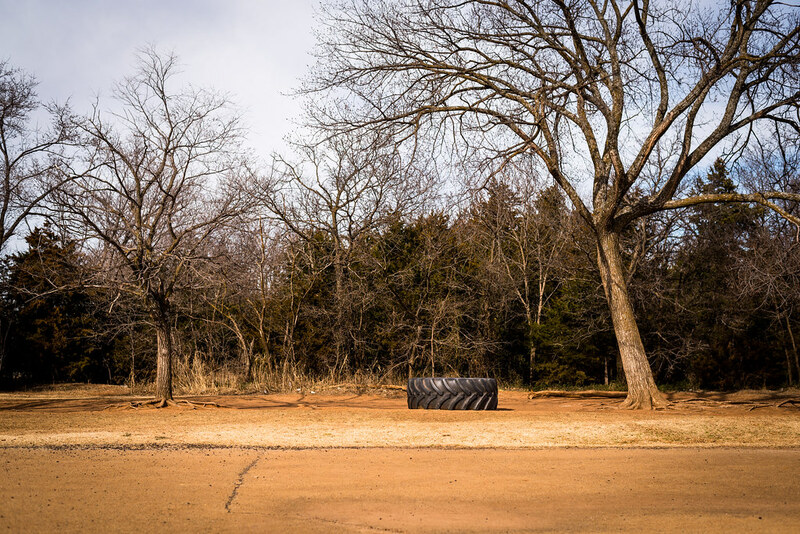 Maybe this tire is a relic from a long-abandoned farm, or maybe the trees and dusty ground are about to be paved in favor of an urban revitalization project. What about the people, though? Who put the tire there, and why? Why is it sitting abandoned between two trees? The real story here is, I’m afraid, actually quite simple and mundane. This photo was taken behind my son’s elementary school when he and I went on a bike ride on a warm afternoon in February. In the foreground is a cracked cement basketball court and in the background you can see a line of trees that mark the border of the school’s outdoor classroom. If I turned just a bit to the left you would see a large suburban water tower, and a bit to the right is a set of fairly modern playground equipment. This tire, according to my son, is just another playground fixture that the kids like sitting on and I’m guessing it was donated by a local farmer who no longer needed it. While the image in and of itself might conjure up all sorts of ideas and stories, the truth is much less interesting. I took this image specifically to illustrate the ability photographers have to shape perceptions of the world around us. It would have been interesting to put a kid in the shot and see if that affected the viewers’ interpretation of the scene as well, but as it stands I view this as a case study in how the pictures we take, the decisions we make when editing them, the angle from which we shoot, the lens we use…all these are creative and hopefully quite intentional tools and techniques that can be used to tell a story. I do think photographers have a responsibility to accurately represent the world around them, but that doesn’t mean there is no room for creative expression either. We walk a fine line sometimes, and as long as we are truthful and not intentionally deceiving people then I’m happy to dip my toes a bit to one side every now and then just to see what happens. In other words this is the power of photography. And like any other ‘power’ it should be used responsibly. Thanks for sharing. You’re right about that, Thothar. Sometimes I think about everything *not* in the frame when I take a picture, and wonder whether there’s a larger story that’s being left untold because I pointed my camera in a specific direction or only at a certain subject. My, we have gotten quite esoteric today! You have brought out a truly interesting way to think about our photography and what we can do/manipulate/convey with our images. I would have never guessed that this was a picture of a portion of a school playground. I assumed it was a construction site or, perhaps a refuse area. The mechanics of photography (f/stop; shutter speed; ISI) are only a small part of what we can do with this medium. How the subject is portrayed and the story that is presented is vital. Thank you for bringing this to our attention today. It gives a completely new understanding of the power of that instrument we call a camera. I love the picture and the article, I first guessed a playground setting. It is quite amazing looking through the lens of a camera and how differently we can see the world and the opportunities photographers have to shape perception. Thanks for sharing the picture. Simon thank you for your thoughts on the responsibility of a photographer and the story they tell. The video amused me and reaffirmed what I know: What we see in media is not necessarily reality. I find photo editing extremely entertaining, if time consuming, but I have nagging doubts about futzing with the reality. Enjoyed your article. I like that phrase Janet, “futzing with the reality.” We walk a fine line as photographers, don’t we? When does editing become too much? What makes some editing OK while other editing unacceptable? I think as long as we are doing our best to accurately depict reality, and being honest when we are not, then we’re probably OK. These are certainly some very murky waters though! Could be a comment about education funding that the grounds remind you of an abandoned farm. I understand how that is mostly a result of what you chose to include in the frame and entirely an experiment but still a neat observation about editorial composition. I am sure that unintended opinions are floating around in my own photos. Yikes.